Neighbours and friends will gather in Frognal Avenue for a street party to celebrate the Queen’s 90th birthday on Sunday, June 12. HCRA has applied for a special road closure from Harrow Council so both ends of the road will be sealed off and cars moved. The event, which will run from 2pm to about 6pm, will feature food – including a FREE BBQ, plus games for children and music. There will also be a raffle with the chance to win some great prizes, and other fun activities. A group of volunteers has been busy organising the event but more help is needed with entertainment and setting up. Party-goers are also being asked to bring food to share. Frognal residents can help by ensuring cars are moved to the Civic Centre car park by 10am on the day of the party. Harrow Central Mosque has said it will strive to minimise disruption to neighbouring residents during the holy month of Ramadan. This year the month of fasting will take place between June 6 and July 7, which will see many more people attend the mosque at the top of Rosslyn Crescent. In a letter to residents, the mosque committee said it was working hard to miminmise inconvenience. Worshippers will be asked to park in the Civic Centre car parks rather than in Rosslyn Crescent and Frognal Avenue. During Ramadan stewards and security guards will be on duty outside the mosque and patrol surrounding streets in an effort to ensure visitors comply with parking regulations and keep the noise down. As usual the mosque is operating an emergency text number for any urgent problems such as cars blocking driveways. Residents can text 07784 927045 but have been asked not to call the number. Residents also have the option of contacting Harrow Council’s parking enforcement team to report issues with illegal or irresponsible parking. The team can be contacted on 020 8424 1858 during normal office hours from Monday to Friday, or on 020 8863 5611 at other times. 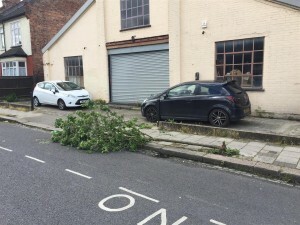 Residents have expressed their shock and anger after two trees paid for by the local community were vandalised in Rosslyn Crescent. Both trees were planted several years ago as part of HCRA’s tree campaign. Neighbours were horrified to find the trees had been pushed to the ground and their trunks snapped. The incident has been reported to the police and Harrow Council. Greenhill ward councillors joined local people in expressing their dismay. 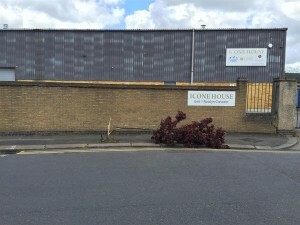 Meanwhile council officials promised the trees would be replanted. It was a race against time to get rid of all the junk collected at this year’s Dump Run event. Long queues at the town dump and heavy traffic meant our tipper truck was held up and so the HCRA team had to hire the vehicle for a second day to ensure all rubbish was cleared. As usual there was plenty of junk for us to take away. Once again we teamed up with the RSPCA to ensure good quality items went to charity instead of landfill. 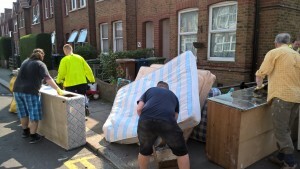 Yet again the team also tackled pile-ups of illegally dumped waste including fly-tipping in the passage between Rosslyn Crescent and Woodlands Road and in an alleyway between Rosslyn and Frognal Avenue. Fly-tipped items included fridges, washing machines, mattresses and garden waste. HCRA continues to monitor fly-tipping and raise awareness among local residents about how to dispose of waste properly. Volunteers also weeded and planted summer bulbs in all of the tree pits in our three roads. The association would like to help everyone who helped out with this year’s event including everyone who made donations and provided refreshments.